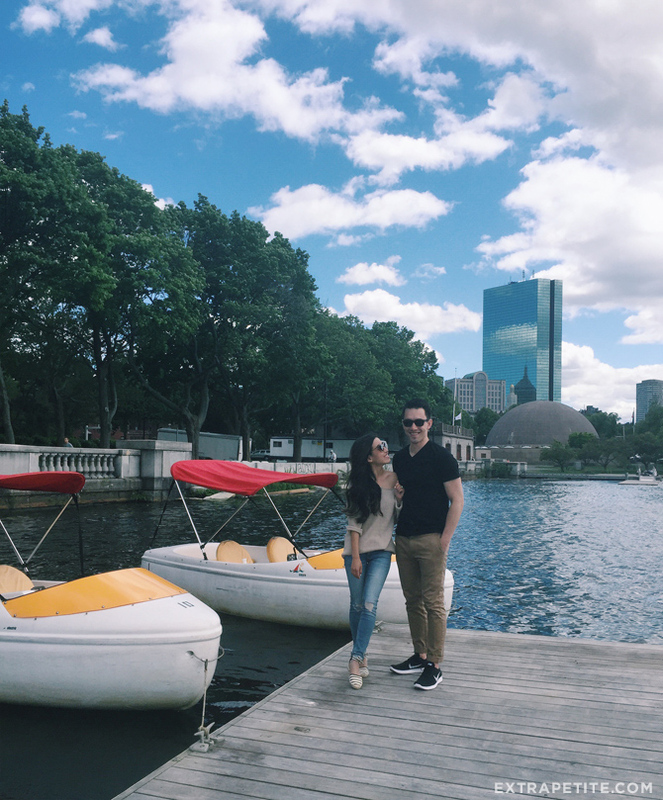 Nick and I each moved to Boston for school thinking it’d be temporary, but the charm of this small, historic city (with no shortage of seafood…yum) grew on us tremendously over time. We often get questions on what to do and where to eat, so finally pooled our favorites into this mega post! I’ll be keeping this updated and will add any new or forgotten favorites. Let me know if you guys have any questions, and be sure to check out my map at the bottom to see where everything mentioned here is located! When traveling we like to visualize where all the places we want to hit up are located, then find somewhere to stay central to those. Boston is very much a walking city, so pack your flats! One of my favorite paths to walk is starting at Hynes or Copley subway station on the green line, going along Newbury Street (our biggest shopping street) all the way to the Boston Public Garden and Boston Common. There you can also have a picnic, take kids on the (very slow-moving) swan boats or merry-go-round, and eat soft serve from the Boston Frosty truck. There is a week of gorgeous tulips in mid-spring, foliage a-plenty come Fall, or you can ice skate on the “Frog Pond” in the winter. From the Boston Public Garden, you can walk to either the small boutiques in charming Beacon Hill, grab a bite in Chinatown, or follow the Freedom Trail through Quincy Market to Charlestown. Clothing and shoes under $175 are exempt from sales tax in Massachusetts, so I see many visitors shopping their merry hearts out. For individual items priced over that amount, the first $175 is still tax-exempt. Newbury Street is an outdoor shopping area with lots of high and low end shops, ranging from Zara, Forever 21, H&M;, to Burberry, DVF, Kate Spade, Chanel, and much more. I also like the Copley Place & Prudential Center malls, which are right nearby. These indoor malls have department stores like Barneys, Neiman Marcus, Saks, and a variety of designer boutiques and shops like Sephora, LOFT, Banana Republic, Club Monaco, Stuart Weitzman, etc. We have a delicious variety of pick-your-own farms in MA, however most are a 30 minute + drive outside of Boston. If you happen to have a rental car, be sure to check out what’s in-season for picking! Berries (strawberries, blueberries, cherries) start late spring through the summer, peaches ensue in late summer, and then apples, pears, and pumpkins are in full swing come fall. Here are a few of my posts at local farms: Tougas Farms (also here), Honey Pot Hill, Parlee Farms, Verrill Farm. 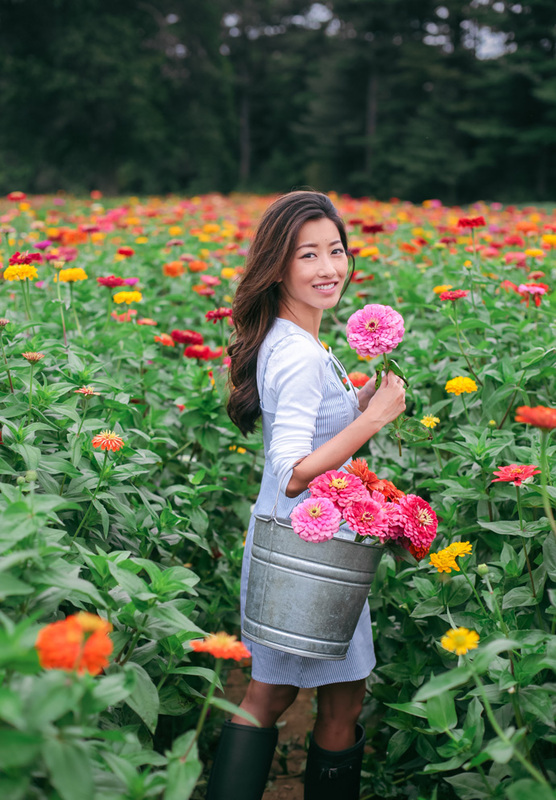 For lovers of fresh blooms, Wicked Tulips in RI can be picked April – May, Parlee Farms up north has gorgeous zinnias & dahlias in August – September, and Colby Farms has a field of sunflowers that peak briefly in September. Note though that Colby Farm’s flowers are for viewing, not for picking! Each of these farms are about an hour outside of the city, in different directions. If the weather is nice, you can walk or run along the Charles River on the Esplanade path. You can rent kayaks or canoes from a small stand stationed near the Hatch Shell. From the river, you can see Boston on one side and Cambridge on the other. Pack some sandwiches and drinks to refuel while out on the water! 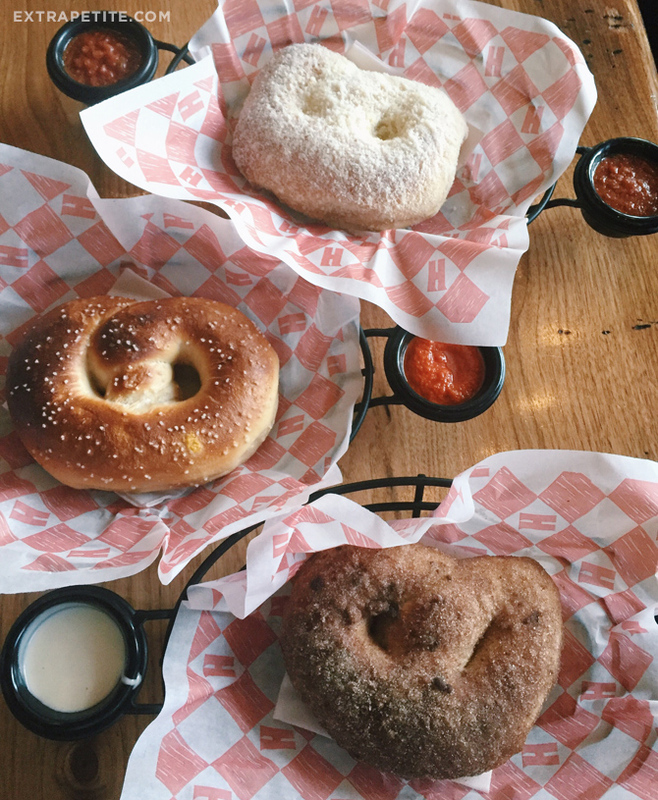 – Visit Harpoon brewery for a flight of beer, or more importantly, their freshly baked soft pretzels (the cinnamon sugar one with cream cheese icing dip … droool). I also love to drink Downeast Cider but haven’t yet been to their tasting room. It’s located in Charlestown, the town where the Freedom Trail ends, and is open on the weekends. – Stop by the Copley Square farmers market open on Tuesdays and Fridays, from Spring to Fall. Or if you’re by the south end, visit the SoWa market which is open Sundays May – October, featuring food trucks, a vintage market, and tents run by small artisans. – Pop into the historic Boston Public Library. 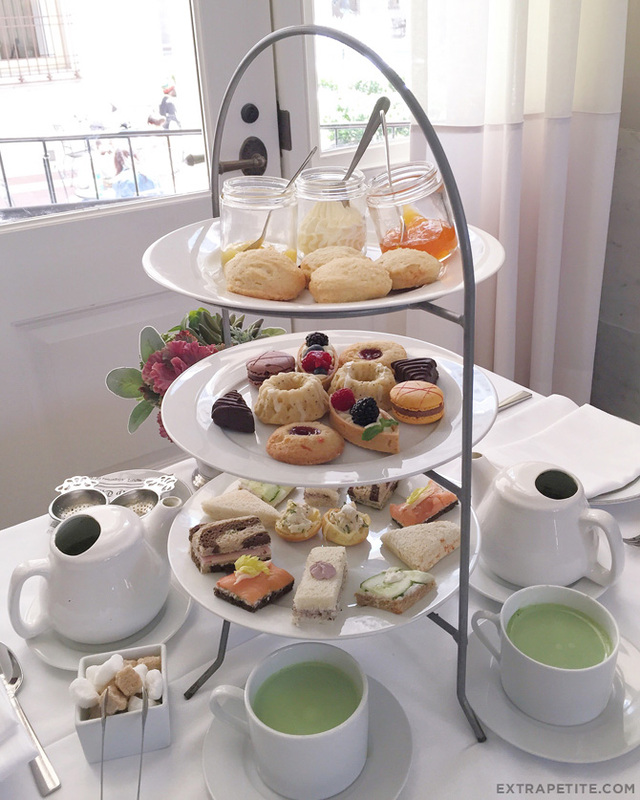 Pinkies up for their tea set of savory sandwiches and sweet treats, and of course your own potful of tea. The BPL is one of my most favorite spots in the city, although I’m a little biased since we got married there! – Take a Duck Tour which is an amphibious vehicle that hits up most of the city’s major landmarks, then plops into the Charles river to show a bit of Boston via water. – Catch a Red Sox game at Fenway Park, then chow down at one of the many nearby food options on Peterborough Street (Rod Dee Thai, El Pelon Mexican, Sushi Kappo) or get some famous biscuits from Sweet Cheeks BBQ (run by Tiffany Faison, a Top Chef finalist) afterwards. – Explore the Boston Harbor islands via ferry or boat tour. Recommended for history buffs (hotspots include war forts and a historic lighthouse) or hikers, not those seeking beachy sand to sunbathe on. – Check the Boston Calendar for a list of local happenings, events, classes, or other things to do. 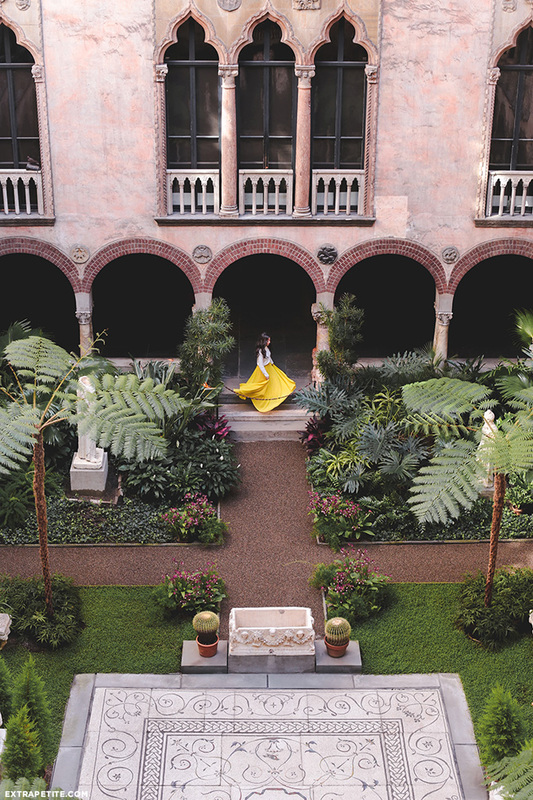 – Visit the Museum of Fine Arts, Isabella Gardner Stewart art museum (indoor courtyard pictured below), or the Museum of Science. A rental car is not necessary while in Boston unless you want to do a lot of day trips to the outer areas. In fact, finding and paying for parking is quite a burden, so I always suggest visitors take Uber, Lyft, a cab or try public transit on our MBTA train system. – Jugos – Tiny, tiny to-go only spot located centrally near Copley Square, so on a nice day you can enjoy your food on the benches there. I’m far from a “clean” eater but this place is tasty and fresh. 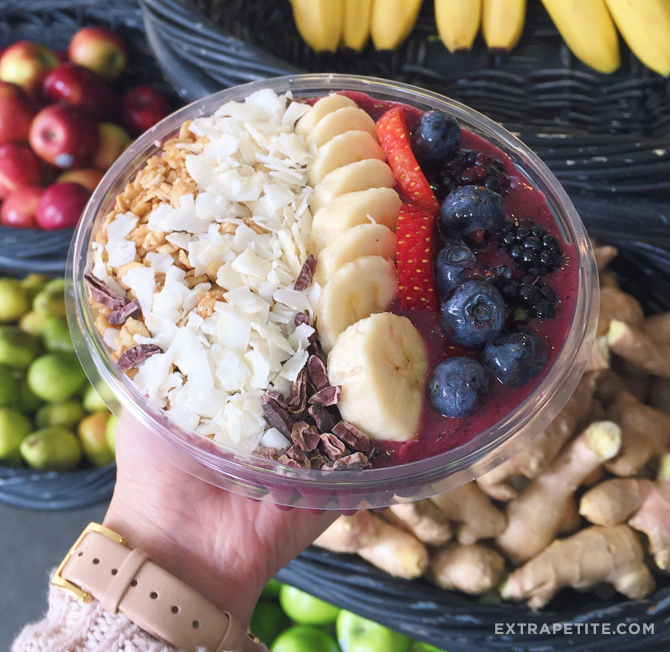 My favorites are the juices, frozen acai or pitaya (dragonfruit) bowls, and their chicken salad avocado toast. I have a weakness for coconut + cacao chocolate nibs atop my bowl…tastes like dessert! – Tatte – A cute, Instagram-able local bakery/café with multiple locations, easily some of the most Instagram’d spots in town. I like the location in charming Beacon Hill, but be warned it’s a zoo at weekend brunch time! 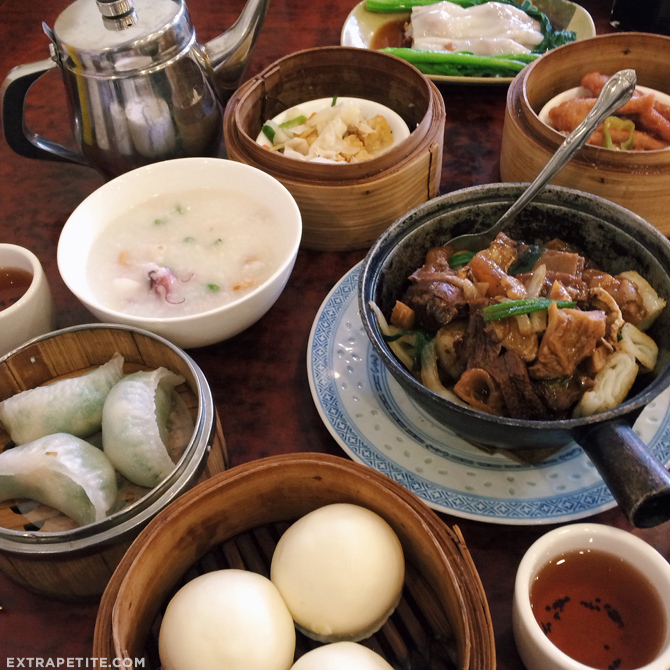 – Dim Sum – for the actual “ladies wheeling around push carts full of dim sum” experience we go to Hei La Moon (weekends only, and good for bigger groups). If it’s just the two of us or if it’s a weekday, we usually do Great Taste, where you can order dim sum off a little checklist daily until 4pm. They also have this traditional dish we love which is braised beef brisket & tendon over seared rice noodle rolls (pictured in the iron pot below) – it’s only written in Chinese on the wall and not in the regular menu. My mom ordered it once and now we just point or pull up this pic! – Coppa – Italian small plates spot in the south end with an outdoor patio, and a few additions during brunch hour including “hangover” pizza and Shakshuka baked eggs in a yummy sauce. – Coffee – I’m more a tea person, but Nick’s favorites are the Thinking Cup on Newbury Street (right by all the shopping) or the Buttery in the south end. If you’ve seen the movie Spotlight, Rachel McAdams’ character enjoys the Buttery which is right in my hood…had I known, you can trust this closet Notebook fan would’ve been lurking outside at the time!! 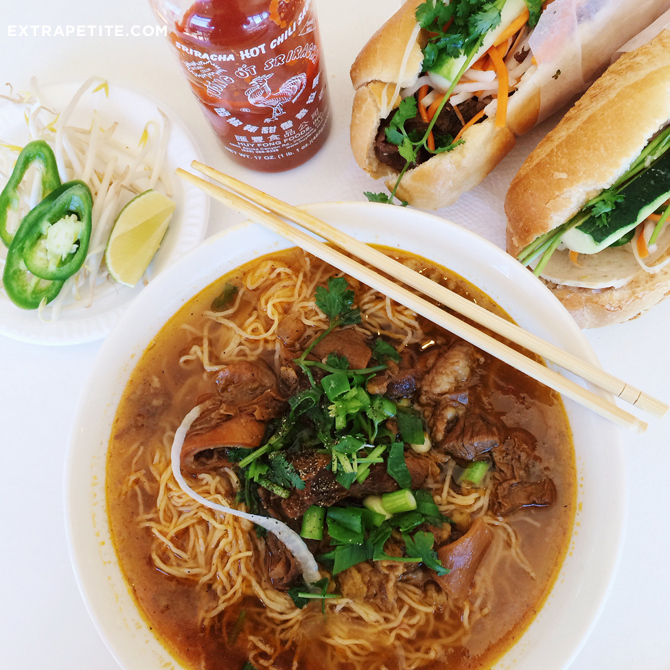 – Pho noodle soup – If you happen to be in the Allston area, my favorite spot is actually Pho Viets inside the Super 88 asian food court. There is no ambiance here so we usually just slurp with our heads down or get it to-go. – Futago Udon – smaller but baby-friendly restaurant with a changing table. The fried chicken curry udon isn’t what I usually go for, but it was surprisingly delicious! – Chicken & Rice Guys (note: no seating. They also have several food trucks which you can track here) – a grab & go lunch spot. Modeled after NYC’s popular “Halal guys” (which is now also in the Boston area!) but actually tastes like real meat. A small combo (chicken & lamb gyro over rice) is usually plenty to fill me up – don’t forget to douse it in their yummy sauces! – Taiwan Cafe – Most decent soup dumplings in town, which doesn’t say much if you have a Din Tai Fung near you…but most of us don’t. What to get: juicy soup dumplings (transfer to your soup spoon carefully, nibble a hole off the top, and sip the soup out slowly to avoid a traumatic mouth-scalding experience), regular pan-seared dumplings, scrambled egg with beef & tomatoes rice plate (Chinese comfort food), Szechuan style white fish in spicy broth (“shui zhu yu”). 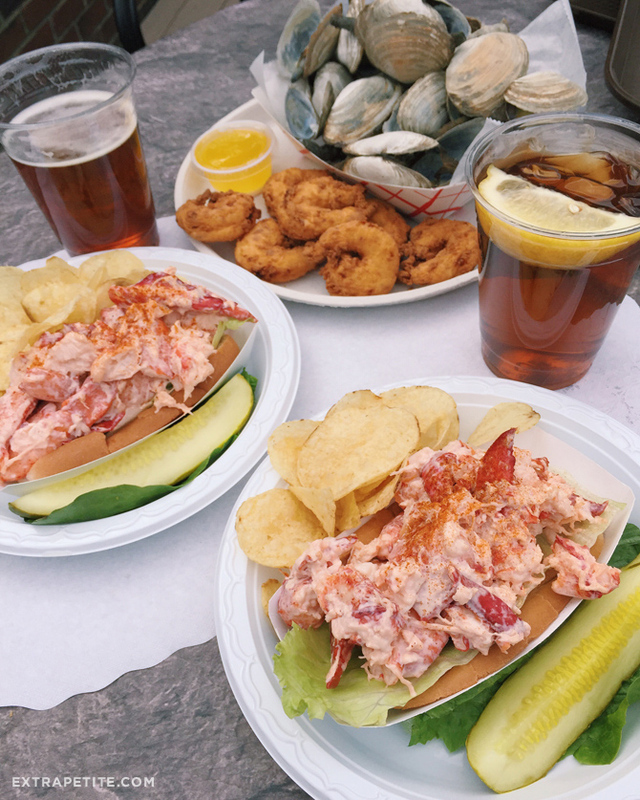 – For good ol’ New England seafood … there’s the fisherman shack James Hook where you can grab a roll to-go or Yankee Lobster Co (right by Harpoon Brewery), both of which are a bit toursity. If you’re in Quincy (neighboring town to Boston), Tony’s Clam Shop has lobster rolls, fried seafood & steamers right by a small strip of water. If you haven’t had steamer clams before, they are so big & tasty when in-season…our out-of-town visitors can never get enough! For a different take on the classic lobster roll, Eventide is in the Fenway Park area and serves their lobster atop a pillowy “bao” bun. Also, Luke’s Lobster is a chain but I’ve always enjoyed the seafood rolls there! – Shabu Zen (2 locations) – my weekly go-to for comfort food, especially in colder weather. 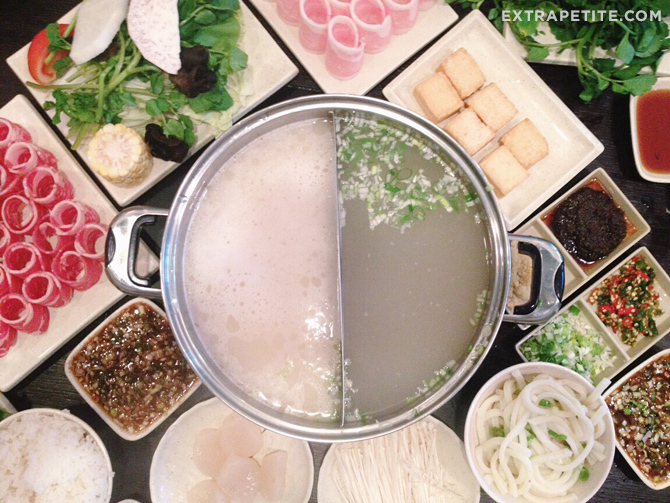 If you haven’t had shabu or hot pot before, your ingredients come uncooked so you cook them quickly in a boiling pot of broth, then eat with a dipping sauce that you mix up in your little sauce cup. What to get: combos (either the pick 2 meats combo, boneless shortrib, or the tontoro pork combo) that come with veggies, rice or udon noodles; whole shrimp to add flavor to the house broth, and watermelon smoothies. – Salty Pig – Restaurant with large patio right by my afore-mentioned shopping malls focusing on charcuterie, pizzas, and craft beer … aka the express path to my husband’s heart. I do appreciate that they make a lot of their own charcuterie and pasta. Sundays are “red sauce Sundays” with cute checkered table cloths. – Holly Crab – If you like cajun-style seafood boils, this place really hits the spot with seafood that comes in plastic bags smothered in garlicky, spicy, buttery and citrusy goodness. Put on the bib and rubber gloves, and leave your white silk blouse at home. Their crawfish here are very small, so our go-tos are the shrimp, mussels, and king crab legs (a splurge but so good) in holly crab medium sauce with sides of corn and sausage in the bag. Shaking Crab is a Boston chain that is also very good, with one location right by the Public Garden! 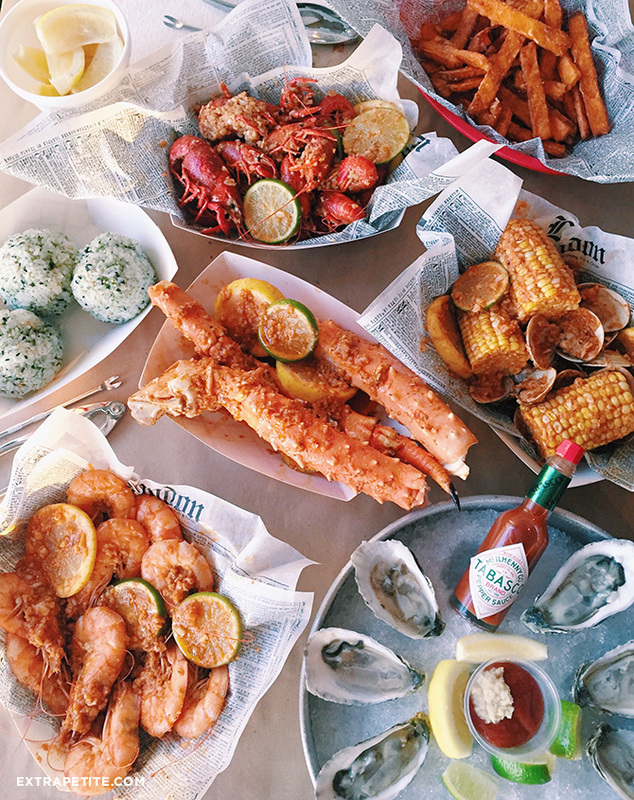 – Best oyster happy hour spots (note: these happy hours are frequently subject to change, so please call ahead to ask) – You can’t come to New England without indulging in fresh oysters, but they can add up at the usual $3+ per piece! Precinct has $2 oysters daily from 4 – 6PM, and a large patio with TVs for when it’s nice out. Les Zygomates wine bar has $1 oysters weekdays 3 – 7PM at the bar area, Bar Boloud (at the Mandarin Oriental hotel) has them in the summer if you need a break from shopping on Newbury Street, and Marliave in downtown Boston has $1 oysters daily at either 4 – 5PM, or 9 – 10PM. Their oysters for some reason often lose their brine (my favorite part) by the time they reach me, but on the plus side Marliave has some yummy house-made pasta dishes like their Sunday Gravy. 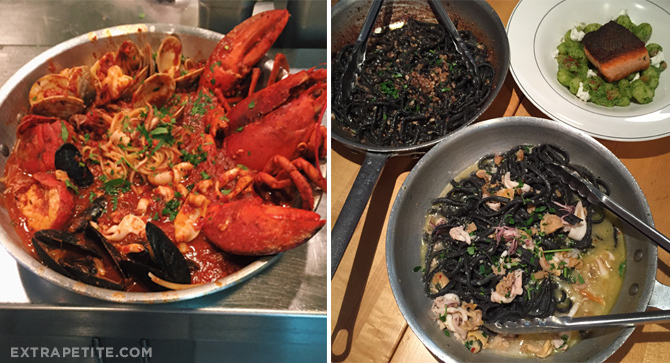 – The Daily Catch (multiple locations) – small, “cozy” Italian seafood pasta spots known for their lobster fra diavolo dish made for sharing. We also love the aglio olio, which is their house-made squid ink pasta (you can substitute this noodle in most of their other pasta dishes too, for a small charge) tossed with oodles of garlic and ground calamari. I keep highlighting the spots with fresh house-made pasta, as some of the most popular Italian spots here don’t make their pastas or even their sauces! We prefer the Brookline location for this restaurant, as the North End one has rushed and at times, rude service (neither take reservations). – Neptune Oyster in the North End (little Italy) is the most hyped spot for a big, hot, buttered lobster roll (market price on average is $30-$35). Their food though is always yummy and I like the ambiance, but it’s a small restaurant and a wait could easily set you back a few hours, unless you line up 20 minutes before they open! I’d also recommend getting the johnnycake appetizer, which is like a cornbread-style pancake with honey butter, whitefish pate, and caviar combined in a sweet and savory perfection. – Barcelona Wine Bar – tapas spot with 2 locations in Boston. This is actually a chain restaurant from CT, but they do a great job with ambiance and catering to local tastes (their bread from a local bakery is heavenly, always hot and fresh). They have a regularly changing menu and are always packed around dinner or brunch time, so make reservations. Some staples I like that are usually always on the menu: charcuterie, hanger steak w/ truffle sauce, patatas bravas (potatoes doused in garlic aioli), and wine flights. – Toro – another tapas spot, by Ken Oringer, one of my favorite chefs in town. What to get: The cheesy Mexican-style corn, seafood paella (better than others in town; half size is plenty for sharing! ), roasted cauliflower, bone marrow topped with braised oxtail. It’s so yummy, we’d eat here all the time if it weren’t for the fact that they don’t accept reservations, and the wait at dinner time can be 1-3 hours (so go right when they open to put your name down)! – Island Creek Oyster Bar – I can’t speak to their other dishes, but their signature house made lobster roe noodles with braised shortrib and grilled lobster on top is scrumptious (and priced accordingly at just under $40). This is only served at dinner. Be sure to make reservations about a week in advance! – Drinks – Nick and I have opposite tastes in alcohol (he’s a beer, whiskey and scotch man, and I prefer anything but) but one thing we can agree on is we both love the drinks at Shojo. If you don’t like strong tastes of alcohol, I’d recommend their gin gin mule with housemade ginger beer (very strong ginger flavor – you’ve been warned), reiko greene with giant cucumber ice cube, cold tea for 2 which is a bit insidious because it tastes so normal, or their “agogo” drink. Snack on their chicken & waffles (egg puff-style waffle), house-made noodle dish of the day, or mini pork belly buns in-between drinks. Nick also likes the menu-less bar Drink where you blab out what types of things you like in a beverage and the bartender makes you something, while you munch on their complimentary buttery popcorn. 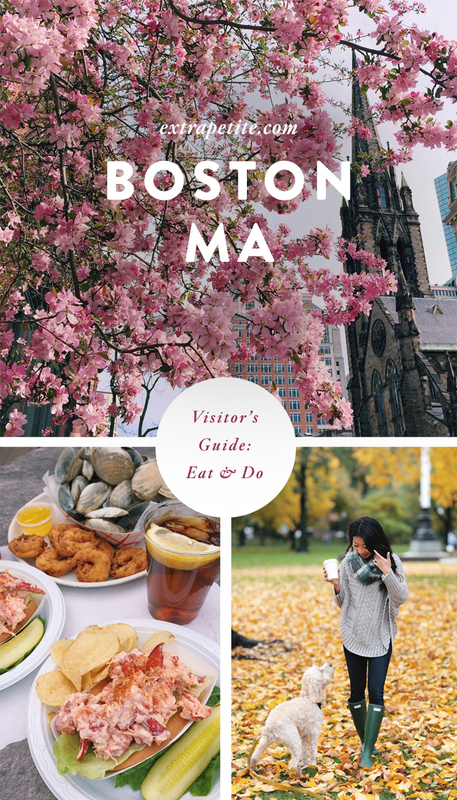 If you’re visiting Boston and do check out some of the above spots, leave me a comment and let me know what you think! And for fellow Bostonians or those who have been here, I’d love to hear what some of your favorite places are! Try Priceline, using the "name your price" option. Boston has a ton of hotels, and the city is compact enough that it's hard to go wrong. September (but not Labor Day) is a nice time to visit. One of my favorite restaurants and very favorite coffee roaster is in Boston! You guys should try Craigie On Main in Cambridge, and George Howell (I think there's also a location in Boston Public Market now) for coffee. Don't add anything to your pour-over or chemex and let the beans shine. I'm also a huge fan of Giacomos in Little Italy, even though the line is always long. I never knew what to do in Boston when I visited a couple years ago….thanks for sharing this! Are you really under 5 ft tall? You look so tall, like 5ft6..
Myers and Chang is beyond my favorite. Then Sorelina, Toscano and L'Espalier. My fav lunch spots: Luke's Lobster, Flour, Tatte, Sweet Green, Render Coffee and Shake Shack every now and then. My husband and I moved to the Cape a few years ago and the number one biggest thing I miss is a good bowl of pho! Can't wait to get to Boston and try your recommendations. Thanks! Piattini Cafe – it's a hidden gem on Newbury St! Their lunch menu is super affordable and all of the sauces taste homemade. Q Restaurant – sorry Jean but I have to say that Q > Shabu Zen! Sugidama – another hidden gem, they serve soba in Davis Sq! Thanks for the detailed guide. Saving for later bc Boston has been on my list for such a long time now…. I didn't realize you could do that! An oyster tour sounds like a slice of heaven to me. I'd love to hear your experience of the tour. Hi Jean, Do you know the name of the nail color you are wearing in the picture with the oysters? We visit Boston every year, but there's always something new to check out. Thanks for the helpful guide – will be sure to check out some of these places during the next drive up! I will be visiting Boston this in August this year. Your post is pretty helpful and makes me look forward to being there. Hi Jeanette – we just returned from Boston yesterday, our first visit to this amazing city. I'm ready to go back. We used airbnb.com for lodging. 7 nights of lodging cost $968. We also took advantage of the GoBoston Card that allowed us entry to many attractions. Check out http://www.smartdestinations.com then select Boston for details. NOTE: If you are a Costco member, you can purchase these cards through Costco online at a reduced cost. I purchased the 3-day pass for $86.99 rather than the regular cost of $109. We used public transportation during our visit. The transit system, MBTA.com is wonderful and very easy to use. Their website has a "Trip Planner" that I used a lot. We purchased a "7-Day Charlie Ticket" which allowed for easy access on the subway, trolley and buses. This is the way to go. The only time the transit system did not work for us is when we had to get to the airport by 4am. So we used Uber for the very first time. I would definitely use Uber again. Very convenient. I hope some of these tips will help you in your planning. We also have to travel on a budget so I did a lot of searching prior to getting to Boston. Jean – I have followed your site for several years now. I truly admire you and your style. Thanks to you, I have changed, or shall I say, improved my style. Your post on visiting Boston published while I was visiting, but from your previous posts, I was able to experience many sites based on your recommendations/photos. The BPL is amazing. I enjoyed the Public Gardens and Swan Boats. And the pastries at Tatte are wonderful, to name a few. I only wish I could have run into your while enjoying this beautiful city. I hope to return someday. Thank you for your posts. I always look forward to them. I was in Boston last year at about this time and it's a beautiful laidback city. I had a blast. Thank you for this awesome tips. I will definetely bookmark this post to come back before my next trip to the US. Thank you Jean for this post! My husband and I road tripped through all of New England and ended up in Boston for a few days. We have been doing that trip every several years since and this year we are going again. We only got lucky with the foliage once. Other times we went too early or too late. From your experience, when would you say foliage is at peak in Boston? Beginning of October, mid Oct? Thanks! This may be a noob question, but I've always wondered how do you create the customised google map? Thanks for these great tips. Making reservations as we travel next week. Any ideas on things to do with my 15 year old . . . that may pry him away from his phone?? Great tips, thank you. Any ideas on what to do with our 15 year old son? Anything to pry him away from his phone?? this is a wonderful guide. i cannot wait to visit! I’m here and excited to check out some of these places! Thanks for this guide…would be cool to see you around town!